Good company while Ciwt's thoughts gather. It's more subtle out here, but we do have it. Her image is famous, but Ciwt is curious: did you like yesterday's painting (Day 4/240)? Many do, many don't. Here she is again along with a bit more information about this famous image. This painting by the English classical painter, Frederic Leighton, is considered his masterpiece, has been widely reproduced in posters and is beloved by many. So why did Flaming Jane go unsold for its reserve price at auction in 1960 allowing a London dealer (The Maas Gallery) to acquire it for $140? ($840 in today's dollars)? For one thing, 1960 (the Abstract Expressionist, Pop Art, Op Art, Color Field Art among other modern movements Era) was not the time to be selling Victorian art. In view of the demand for Rothko, Kline, Stella, Warhol, Rauschenberg, Pollack et al, there was no demand for a stiff, formal, classically painted nymph/goddess figure. But also the painting was controversial in the eyes of many in its own right. The posture was questioned - particularly the positioning and size of the figure's right arm and thigh - as was the reality of the flow of the diaphanous fabric. More damning were the many English critics who called it kitsch. But the painting's supporters feel the transparent material is very real. They hail the stunningly rich colors, perfectly recreated marble surround and Leighton's use of natural light, allowing the painting to be lit by the molten gold of the sunset. In other words, they praise it as embodying "Art for Art's Sake" which was what Leighton and the Pre-Raphaelite school which immediately followed him prized above all. Possibly Flaming Jane's greatest supporter was Luis A. Ferre, a noted Puerto Rican industrialist, politician and founder of the Museo de Arte de Ponce. On a buying trip to London for his museum in 1962 Ferre encountered her at the Maas Gallery, was immediately smitten and bought her for the unheard of price of $2000 (Today @$9,000). He had her restored, and she has been hanging in the Museo's permanent collection ever since. Occasionally she makes visits to places such as the Prado (Madrid), Tate (London) and the Frick (New York where she was for a few weeks this summer). In every case art critical controversy precedes her and continues to grow when she arrives. So she's not quite the innocently sleeping maiden she appears. In fact, it has been pointed out that the red flowers on the ledge above her are oleanders which are known to be poisonous, thus suggesting Flaming Jane is a dangerously alluring femme fatale figure. Other Freudian and Modernist interpretations abound for those who see her painting as much more than Art for Art's Sake. "I'm late! I'm late! For a very important date...," said the White Rabbit. Actually Ciwt has never entirely 'gotten' Alice in Wonderland, and probably would not have paid any attention to the book were it not for the illustrations. Strange, grotesque many of them. But memorable, fitting to the text and done by Sir John Tenniel (British 1820-1914). Tenniel was a prominent (but socially reclusive) English illustrator, graphic humourist and political cartoonist who is best known for being Punch magazine's political cartoonist and illustrating Lewis Carroll's Alice's Adventures in Wonderland and Through the Looking-Glass. He was knighted by Queen Victoria for his artistic achievements in 1893. Contracting with Tenniel was a hard-won achievement by Carroll, one which he may have regretted when the book first came out - in the United States, not England. Why the U.S.? Because Tenniel, who was absolutely exacting in his eye, found the first book inferior in its printing standards. When his objections were cleared, a second printing was released in England in 1865 and became an instant best seller. Since returning from the Getty Center's current show of Hellenistic Bronzes, Ciwt has been researching that era and traveling through the Greek empire, the lives of Alexander the Great, Philip the 1st, Alexander's mother, sister, best friend, Aristotle, and so much more. Ironically, as she has been assimilating the powerful, rich complexity of that ancient era, the simple optimism of North American folk art has called to her. It's just a nice way to clear her head from all those battles and larger than life people and happenings. Yesterday, the first day of Autumn this year, she remembered Grandma Moses. And memories of growing up years vaguely started wafting back: fall in New England where she lived for a while and went to school and college, and even a time when she had seriously considered opening a gallery of folk art back in the Midwest. That would have been right after her post-college New York and Washington, DC years. But, instead of moving to the middle of the country (and possibly/probably losing her shirt in the art 'business,') she went West where she has made her life for over 45 years and put folk art very much on the back burner. Today she discovered Canadian artist Maud Lewis and rediscovered the simple, direct offerings of that type of art. Often born of - but usually not speaking of - hardships; hardships overcome, ignored, or somehow turned into joy, inspiration, love. 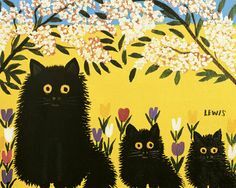 In Maud Lewis's case, she was born with almost no chin and a tiny body. Feeling uncomfortable with her differences from other children, she spent most of her time at home with her parents and brother in Nova Scotia. It was there - as a child painting Christmas cards for sale to local neighbors - that her art career began and slowly grew through newspaper and magazine articles and eventually television documentaries until she became one of the most beloved folk artists in Canada. Interior of the 'painted house' where she and and her husband, Everett, lived. Now restored, moved to Halifax, Nova Scotia and available for the public to view. Especially on this first day of Autumn, 2015, Grandma Moses comes to mind. Did you have Grandma Moses in your house growing up? Ciwt did. We had a set of Grandma Moses plates which Ciwt just Loved eating off of. The borders were white with the image in the middle, so you didn't know what painting was on the plate until you finished your meal. To Ciwt, it didn't matter what was uncovered because she loved them all - although maybe the ones with the checkered house best of all. Vincent van Gogh, (Dutch, 1853-1890)), Irises (originally Les Iris), 1889, oil on canvas, 28" x 36 5/8"
Los Angeles is a city of unexpected discoveries. One memorable one on Ciwt's recent L.A. museums trip was Vincent van Gogh's Irises at the Getty Center. Like her surprise at finding The Woman in Gold in the permanent collection of the Neue Galerie*, Ciwt may be one of the few who didn't know the Getty owned Irises so it was a particular delight to be standing just a foot or so from the actual painting. 'Owned' is an operable word surrounding Irises; many people associate the painting with $53.9 million, the most expensive artwork ever sold at auction. The year was 1987, and two interesting things happened after that: 1. the Irises record stood for almost three years and 2. the 1987 buyer had insufficient funds so the auction house (Sotheby's New York) arranged a private sale to the Getty - which had been overbid in the original auction - for an undisclosed sum. But certainly not a minor sum, Ciwt can safely bet. Too bad that many viewer's minds might be filled with economic thoughts because the painting is fresh, clear and a joy to view. The colors are marvelously and appealingly pure with the blue based leaves and flowers rising with graceful energy from a warm-toned bed of soil . Apparently - because there are no preliminary drawings - Irises is considered a study by art experts, not a fully realized, finished painting. Just based on visuals, Ciwt would disagree. Like Sunflowers*, each Iris is painted with its own individual character, and the painting is replete with complex, often lush and thick brushwork . This plus the size and expense of the canvas and paints strikes Ciwt as the kind of work artists do on finished canvases. Plus there is a joy in Irises that captures a moment in van Gogh's life when he had just arrived at the asylum and was feeling relief at sanctuary and optimistic that he would be saved from his encroaching insanity. Study or finished work, Irises was a beautiful and uplifting L.A. surprise for Ciwt. The sculpture, which is thought to have been part of the remains of the Baths of Constantine had clearly been carefully and lovingly buried some time in antiquity. And even for a Hellenistic sculpture, it was particularly moving and breathtaking. First, that it had survived at all, comprised as it is with copious amounts of bronze - which was valued for its usefulness in coinage, weapontry and jewelry. But even more for its humanistic expressiveness. * The Power and Pathos exhibition (including The Boxer at Rest) will travel to Washington,. D.C. December 13, 2015 - March 20, 2016. LA Trip 2 gave Ciwt an opportunity to observe the area more. On the drive to the Getty Villa she finally got to see the ocean , and it combined with the balmy air and sunshine was somewhere between uplifting and restful. In other words, nice. (Here in San Francisco we don't often get that easiness because we're occupied with the wind and the cold). Another thing Ciwt enjoyed seeing was how some of the museum women put themselves together. Not 'urban/black' like many of us in San Francisco but more festive and free, a little ethnic. Flowy, printed pants and sandals . Loose tops. Looked feminine and comfortable. (But she also saw a lot of fashion mistakes from these same ingredients as well as tons and tons and tons of beach type wear which seemed to be pretty much the uniform ). As she continued to look around she found this blurb on Buzzfeed* which echoed the thoughts of her good friend who lives on the East Coast but has a son in Los Angeles. According to Ciwt's friend, LA is about walking around and encountering small, completely unexpected or riveting storefronts, events, food combinations, behaviors. Delightful surprises. *Yeah and Los Angeles isn’t a monkey here to dance for you. Put some effort into it. Buzzfeed Community posted on Aug. 31, 2013, at 8:30 a.m. While in L.A., Ciwt saw quite a few Hellenistic Era bronze statues, many in the Getty Center's current show: Power and Pathos. It's an extraordinary show which has gathered for the first time over 50 amazingly well-preserved and very moving bronzes from their individual venues throughout the the former Greek and Roman Empires. (Given the value of bronze and its usefulness for weapons when melted, it is a wonder any of these art works exist at all). Other than a few pictures in her college History of Art textbooks, Ciwt was quite uninformed about ancient Greek art and culture before this trip. For instance, because there are numerous Hellenistic statues of Hercules, Ciwt thought he probably lived around that time (Ie, ca 300 BC). Well, no: Hercules - if he existed as a man at all - would have done so prior to 2500 BC. (That's a gap of 2,200+ years). And, because Ciwt had mostly seen pictures in her textbooks of individual statues, she was under the impression that each work was a one-of-a-kind. Well, no again; the early Greeks were already in the mass production business and many images were produced in the hundreds or thousands by multiple foundries. Then back in her Town Car to 'transfer' (L.A. taxi term) to Delta Airlines and home to SFO.